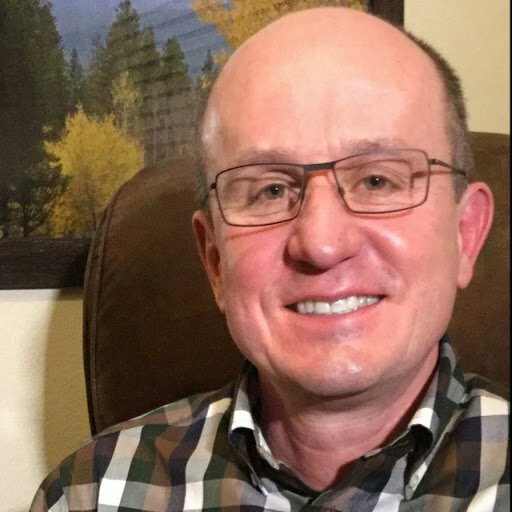 In this post I'm going to take you behind the scenes to get a sense of what is happening in what for most of us is the mysterious world of computer programming. Here is a list of new releases just in the last three months and what they can do and are doing for our clients. An explanation for each and illustration for many is included below. It is the really nuanced backend processes that most of us don't realize are happening that in many ways are most significant. A few are here, but many are not. Thank you Mark and Donna. Email or text? Check their email history. 5 digits or 4 on Check-in name tags. Know when a follow-up assignment (note) is completed. See current or previous group involvement in a group view. Give emailed statement recipients someone to reply-to. See all your registration links in one place. Behind the scenes we now clean up your messy email addresses. We also clean up incorrect mobile carriers to help your texting delivery. Suspend group meeting report reminders for a season. Set who people reply-to on Workflow emails. Create a mail merge file for pledge campaigns. Call or email people from the Volunteer Schedule report. Control who has access to which reports. 1. Email or text? Check their email history. Decide whether to text or email an individual by clicking this new button to instantly see their email open and click rates over the past nine weeks. 2. 5 digits or 4 on Check-in name tags. Want to simplify the alphanumerics on your check-in tags? Go to the check-in view A 4.1. 4 digits is the new default. 3. Know when a follow-up assignment (note) is completed. We added an option to check a box when a follow-up assignment has been completed. Now you can see all the contacts someone makes and track it within an assimilation group. If there is no follow-up date or person, there will not be an option to mark it complete. 4. See current or previous group involvement in a group view. 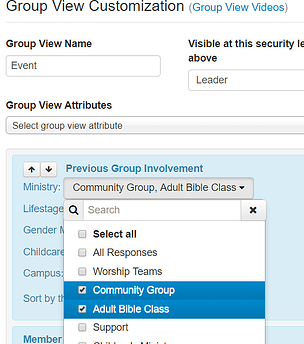 Go to the Group View Customization page and add current or previous group involvement to your list of columns. You can even use our Group Profile questions to limit which groups you see! Like Current and Previous group involvement on the bottom of the member profile page, you will see their enrollment date or the date range of their involvement. Current and previous group involvement is also available as an option in both the group member and the member .csv export reports. 5. Give emailed statement recipients someone to reply to. Change the reply to email address on giving statements by going to Settings / Contributions / Online Giving / Other Options. 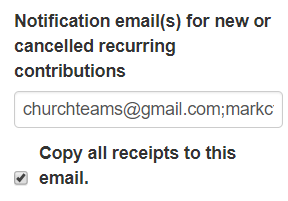 Otherwise the system will use the address in the Contribution Change field under Settings / Notifications. If either of these have multiple emails, the first one will be used. 6. See all your registration links in one place. 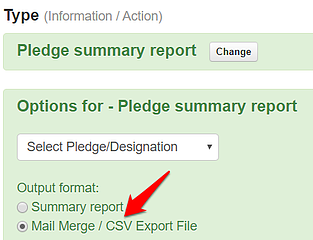 The links for all your registrations have been added to the "Group Information Export to CSV/Excel" report. 7. Behind the scenes we now clean up your messy email addresses. We now periodically run a maintenance program to clean up duplicate email addresses and stray characters that might be in an individual's email address. This will help keep your email addresses cleaner. 8. We also clean up incorrect mobile carriers to help your texting delivery. Last year we released programming to look up mobile carriers for texting. This upgrade fixes failed texts due to bad mobile carriers. 9. Suspend group meeting report reminders for a season. Many groups ministries have their groups take a break for a season. Previously you had to turn off the meeting report reminders and then turn them back on. 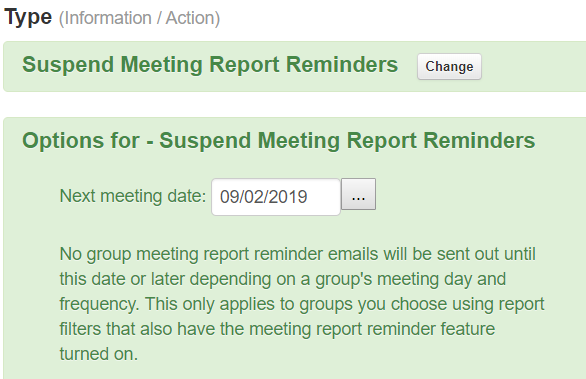 Now, there is a Group report option that updates the next meeting date for the groups you choose in the filters all at once. One touch and your done. 10. Set who people reply-to on Workflow emails. On the Workflow name/description page (Communicate / Workflows) there is now a reply-to option that applies to all emails sent through that workflow. 11. Create a mail merge file for pledge campaigns. Under Reports / Financial, select the Pledge Summary option which takes you to this screen that includes a new option to produce a mail merge file. 12. Call or email people from the Volunteer Schedule report. 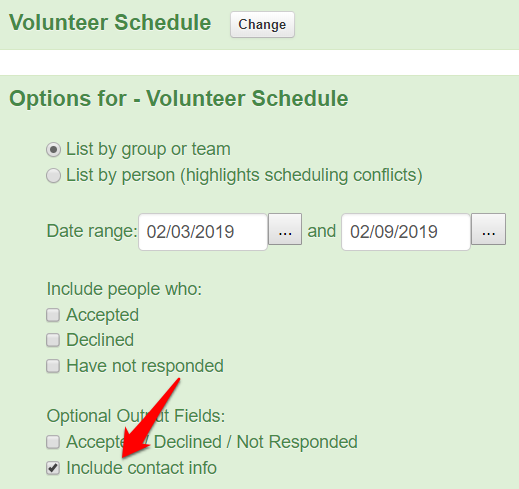 The Volunteer Schedule report under Reports / Groups enables you to see all your volunteers for a given Sunday or any period of time in one report. Adding phone numbers and email addresses gives you easy access to them. 13. Control who has access to which reports. When you save a report there is a new option to edit access based on password security level. 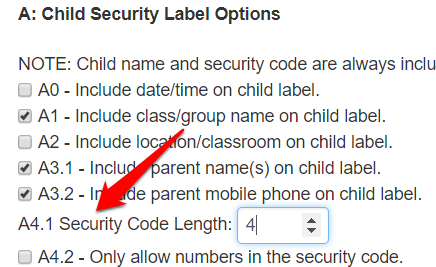 You can also quickly access security options by clicking the lock beside the dropdown for the selected report.